This chapter follows the steps taken when real estate is transferred by sale. The buyer selects a form of ownership. The buyer searches for the real estate to be purchased. In doing so, the buyer will usually deal with real estate brokers. After a parcel is selected, the seller and buyer will negotiate and sign a sales agreement. The seller will normally be required to provide proof of title. The buyer will acquire property insurance. The buyer will arrange financing. The sale and purchase will be completed at a closing. During this process, the buyer and seller enter into a series of contracts with each other and with third parties such as brokers, lenders, and insurance companies. In this chapter, we focus on the unique features of these contracts, with the exception of mortgages (Chapter 12 "Mortgages and Nonconsensual Liens") and property insurance. We conclude by briefly examining adverse possessiona method of acquiring property for free. When purchasers group together for investment purposes, they often use the various forms of organization discussed in Chapter 18 "Partnerships: General Characteristics and Formation", Chapter 19 "Partnership Operation and Termination", Chapter 20 "Hybrid Business Forms", and Chapter 21 "Corporation: General Characteristics and Formation"—corporations, partnerships, limited partnerships, joint ventures, and business trusts. The most popular of these forms of organization for owning real estate is the limited partnership. A real estate limited partnership is designed to allow investors to take substantial deductions that offset current income from the partnership and other similar investments, while at the same time protecting the investor from personal liability if the venture fails. Unity of possessionWhere all parties have an equal right to possession of the property.. All parties must have an equal right to possession of the property (see Figure 31.1 "Forms of Ownership and Unities"). Although the broker is but a special agent, she owes the seller, her principal, a fiduciary dutyA fiduciary duty is a duty of the highest loyalty and trust. It means that the broker cannot buy the property for himself through an intermediary without full disclosure to the seller.. (See Chapter 14 "Relationships between Principal and Agent" on relations between principal and agent.) A fiduciary duty is a duty of the highest loyalty and trust. It means that the broker cannot buy the property for herself through an intermediary without full disclosure to the seller of her intentions. Nor may the broker secretly receive a commission from the buyer or suggest to a prospective buyer that the property can be purchased for less than the asking price. Once the buyer has selected the real estate to be acquired, an agreement of sale will be negotiated and signed. Our discussion here will focus on specific aspects of the real estate contract. The Statute of Frauds requires that contracts for sale of real estate must be in writing. The writing must contain certain information. Although title insurance is usually a sound protection, most policies are subject to various exclusions and exceptions. For example, they do not provide coverage for zoning laws that restrict use of the property or for a government’s taking of the property under its power of eminent domain. Nor do the policies insure against defects created by the insured or known by the insured but unknown to the company. Some companies will not provide coverage for mechanics’ liens, public utility easements, and unpaid taxes. (If the accrued taxes are known, the insured will be presented with a list, and if he pays them on or before the closing, they will be covered by the final policy.) Furthermore, as demonstrated in Title and Trust Co. of Florida v. Barrows, (see Section 31.4.1 "Title Insurance"), title insurance covers title defects only, not physical defects in the property. Despite all these transactions, the critical players are the seller, the purchaser, and the bank. To place the closing process in perspective, assume that one bank holds the existing (seller’s) mortgage on the property and is also financing the buyer’s purchase. We can visualize the three main players sitting at a table, ready to close the transaction. 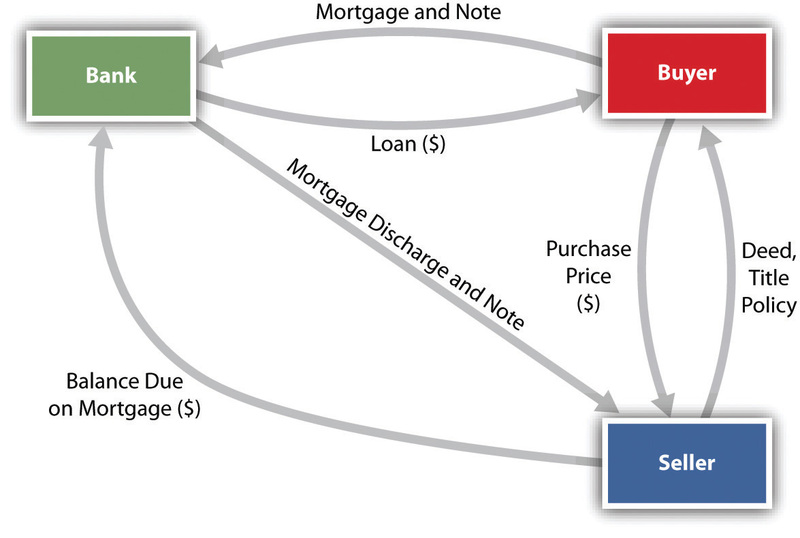 The key documents and the money will flow as illustrated in Figure 31.2 "Closing Process". If the deed is physically delivered to the grantee or recorded, there is a rebuttable presumption that legal delivery has been made. That is, the law presumes, in the absence of evidence to the contrary, that all three conditions have been met if delivery or recording takes place. But this presumption can be rebutted, as shown in Havens v. Schoen, (see Section 31.4.2 "Delivery of a Deed"). Explain how it is possible to own land without paying for it. In some instances, real property can be acquired for free—or at least without paying the original owner anything. (Considerable cost may be involved in meeting the requisite conditions.) This method of acquisition—known as adverse possessionTitle may pass to someone who occupies the lands of another for a certain (statutorily prescribed) period of time in an open, notorious, and hostile manner.—is effective when five conditions are met: (1) the person claiming title by adverse possession must assert that he has a right to possession hostile to the interest of the original owner, (2) he must actually possess the property, (3) his possession must be “open and notorious,” (4) the possession must be continuous, and (5) the possession must be exclusive. Suppose Jean and Jacques are tenants in common of a farm. Jean announces that he no longer intends to pursue agricultural habits and leaves for the city. Jacques continues to work on the land, making improvements and paying taxes and the mortgage. Years later, Jacques files suit for title, claiming that he now owns the land outright by adverse possession. He would lose, since his possession was not hostile to Jacques. To be hostile, possession of the land must be without permission and with the intention to claim ownership. Possession by one cotenant is deemed permissive, since either or both are legally entitled to possession. Suppose, instead, that Jean and Jacques are neighboring farmers, each with title to his own acreage, and that Jean decides to fence in his property. Just to be on the safe side, he knowingly constructs the fence twenty feet over on Jacques’s side. This is adverse possession, since it is clearly hostile to Jacques’s possession of the land. Not only must the possession be hostile but it must also be actual. The possessor must enter onto the land and make some use of it. Many state statutes define the permissible type of possession—for example, substantial enclosure or cultivation and improvement. In other states, the courts will look to the circumstances of each case to determine whether the claimant had in fact possessed the land (e.g., by grazing cattle on the land each summer). The possessor must use the land in an open way, so that the original owner could determine by looking that his land was being claimed and so that people in the area would know that it was being used by the adverse possessor. In the melodramatic words of one court, the adverse possessor “must unfurl his flag on the land, and keep it flying so that the owner may see, if he will, that an enemy has invaded his domains, and planted the standard of conquest.”Robin v. Brown, 162 A. 161 (Pa. 1932). Construction of a building on the owner’s property would be open and notorious; development of a cave or tunnel under the owner’s property would not be. The adverse possessor must use the land continuously, not intermittently. In most states, this continuous period must last for at least twenty years. If the adverse possession is passed on to heirs or the interest is sold, the successor adverse possessors may tack on the time they claim possession to reach the twenty years. Should the original owner sell his land, the time needed to prove continuous possession will not lapse. Of course, the original owner may interrupt the period—indeed, may terminate it—by moving to eject the adverse possessor any time before the twenty years has elapsed. The adverse possessor must claim exclusive possession of the land. Sharing the land with the owner is insufficient to ground a claim of legal entitlement based on adverse possession, since the sharing is not fully adverse or hostile. Jean finds a nice wooded lot to enjoy weekly picnics. The lot belongs to Jacques, who also uses it for picnics. This use would be insufficient to claim adverse possession because it is neither continuous nor exclusive. If the five tests are met, then the adverse possessor is entitled to legal title. If any one of the tests is missing, the adverse possession claim will fail. Real property can be acquired without paying the lawful owner if five conditions of adverse possession are met: (1) the person claiming title by adverse possession must assert that he has a right to possession hostile to the interest of the original owner, (2) he must actually possess the property, (3) his possession must be “open and notorious,” (4) the possession must be continuous, and (5) the possession must be exclusive. Tyler decides to camp out on a sandy beach lot near Isle of Palms, South Carolina. The owner, who had hoped to build a large house there, lived out of state. Tyler made no secret of his comings and goings, and after several weeks, when no one challenged his right to be there, he built a sturdy lean-to. After a while, he built a “micro house” and put a propane tank next to it. Although there was no running water, Tyler was plenty comfortable. His friends came often, they partied on the beach, and life was good. Five years after he first started camping out there, an agent of the owner came and told him to deconstruct his shelter and “move on.” Does Tyler have any rights in the property? Why or why not?